OneDrive is an Internet-based storage platform with a significant chunk of space offered for free by Microsoft to anyone with a Microsoft account. Think of it as a hard drive in the cloud, which you can share, with a few extra benefits thrown in. One of the primary benefits: OneDrive hooks into Windows 10, at least in fits and starts. Microsoft, of course, wants you to buy more storage, but you’re under no obligation to do so. Microsoft’s offers change from time to time, but the general trend is down — prices are going down, fast, and it won’t be too long before most online storage asymptotically approaches free. The free storage is there whether you use your Microsoft account to log in to Windows, even if you never use OneDrive. In fact, if you have a Microsoft account, you’re all signed up for OneDrive. Many people find OneDrive — at least the Windows 7, 8, and 10 versions of OneDrive — very confusing because, in essence, OneDrive keeps two sets of books. (Windows 8.1 OneDrive, by contrast is quite upfront about the whole process.) In Windows 10’s OneDrive, there’s the whole OneDrive enchilada stored on the web. But there’s a second, shadow, subset of OneDrive folders that are stored on your computer. Some OneDrive users have all their web-based files and folders stored on their computers, and OneDrive syncs the folders quite quickly — what you see in File Explorer is what’s stored in the cloud, and vice versa. But other OneDrive users have only some of their OneDrive folders on their computers. File Explorer shows them only this subset of folders and hides all the others that are sitting in the cloud. If you aren’t confused, you obviously don’t understand. OneDrive does what all the other cloud storage services do — it gives you a place to put your files on the Internet. You need to log in to OneDrive with your Microsoft account (or, equivalently, log in to Windows with your Microsoft account) to access your data. If you log in to a different Windows 10 computer using the same Microsoft account, you have access to all your OneDrive data through the web but, surprisingly, not necessarily through File Explorer. In fact, if you look only at Windows File Explorer, you might not even know what data is sitting in your OneDrive storage. This is one of the most confusing and dangerous parts of Windows 10. Realize that Windows File Explorer, when looking at OneDrive, is lying to you. Windows File Manager says there are four folders in OneDrive. But the web version of OneDrive says that there are six. File Manager lies. 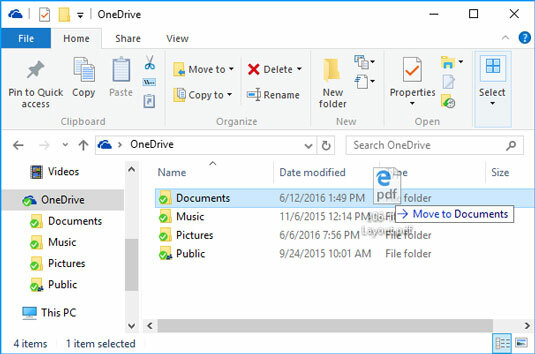 File Explorer offers a very simple process for copying files from your computer into OneDrive, as long as you want to put the file in a folder that’s visible to File Explorer. File Explorer lets you move files in the other direction, from OneDrive storage onto your local hard drive, but again you must be able to see the file or folder in File Explorer before you can move it. Click and drag files into the OneDrive folder in File Explorer, if you can see it. You can share files or folders that are stored in OneDrive by sending or posting a link to the file or folder to whomever you want. So, for example, if you want Aunt Martha to be able to see the folder full of pictures of Little Billy, OneDrive creates a link for you that you can email to Aunt Martha. You can also specify that a file or folder is Public, so anyone can see it. To work with the OneDrive platform on a mobile device, you can download and install one of the OneDrive programs — OneDrive for Mac, OneDrive for iPhone, iPad, or Android. The mobile apps have many of the same problems that you find in File Explorer in Windows 10. In Windows 10, you don’t need to download or install a special program for OneDrive — it’s already baked into Windows. If you have the program installed, OneDrive syncs data among computers, phones, and/or tablets that are set up using the same Microsoft account, as soon as you connect to a network. If you change a OneDrive file on your iPad, for example, when you save it, the modified file is put in your OneDrive storage area on the Internet. From there, the new version of the file is available to all other computers with access to the file. Ditto for Android devices.